As most fight fans know, the amateur ranks in MMA are used to build experience and to get a taste of the in-cage competition. Rarely do amateur records appear reported correctly in record databases and while they do offer a glimpse of what the fighter’s potential is, an amateur record doesn’t always reflect onto what their professional career will amount too. However, for two amateur fighters scheduled to face off in December; there records indicate an extremely high ceiling for potential success. On the undercard of the Fresquez Production’s “Havoc” event headlined by Holly Holm, undefeated amateurs Jerome Rivera (3-0) and Ricky Esquibel (3-0) are set to be the highlight of the evening’s amateur undercard. Fighting out of the acclaimed Jackson-Winklejohn gym, Esquibel has that he is part of the strong wave of youth in MMA’s current movement. 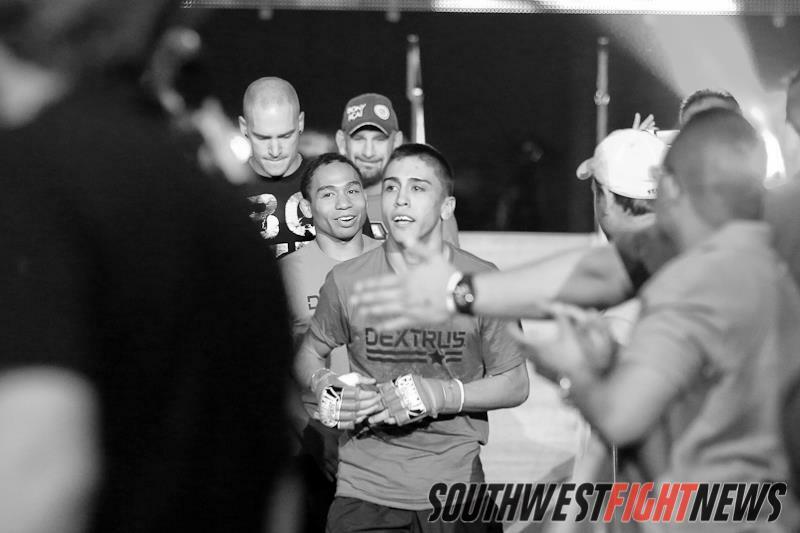 Doubling as a fitness instructor in Albuquerque’s UFC Gym as well as being part of the Gracie Barra New Mexico team, Esquibel has no shortage of quality training around him and his assembly of training partners arguably couldn’t be better especially considering Esquibel is only three fights into an amateur career. Rivera is considered by many who have seen him in action as one of the premier young talents in the state. The 18-year old is seemingly light-years ahead of someone of his age and his training under Scott Marlowe at Judgement MMA in Rio Rancho has him poised to make a mark in the amateur circuit before his teen years come to an end. Rivera is the prodigy of Santa Fe’s Joshua Montoya who also takes contributes largely to Rivera’s fight camps in their hometown of Santa Fe. The two are very talented in all facets of MMA but Esquibel has shown more in the striking game then Rivera has thus far. Rivera has ended his fights quickly via submission after landing brutal ground and pound on his grounded opponent. Esquibel on the other hand has seen the end of a third round on two occasions. Rivera will be the fresher fighter as he has competed in each of his amateur fights in 2013 and Esquibel hasn’t fought since December of last year. Regardless, the fight should come with high anticipation as both Rivera and Esquibel are two of the area’s very best young talents. Stay tuned to SWFight.com for more event coverage, bout breakdowns and analysis. For more updates follow me at @KingStark24 and follow the site at @SWFight.